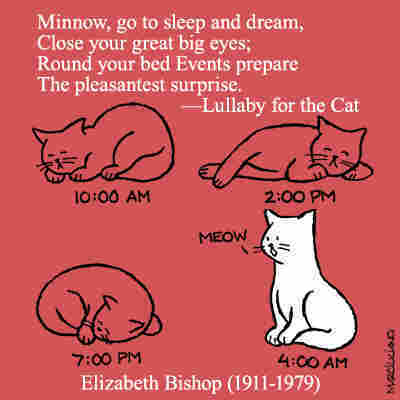 A Cartoon Tribute To Cats, And The Poets Who Loved Them As National Poetry Month comes to a close, cartoonist Francesco Marciuliano sketches his way through three centuries of cat-loving poets from Christopher Smart's sacred mouser to Margaret Atwood's yellow-eyed feline companion. Tuesday marks the close of National Poetry Month, a 30-day celebration of all things versified and all people versifying. And in tangentially related news, for more than eight months, a book of cat-themed poetry — I Could Pee On This — has perched on the NPR best-seller lists. There it sits, insouciantly swishing its tail amid self-help books and memoirs, the poetry world's sole representative on the list. Gazing at this collection of "poems by cats" week after week, I wondered: What is it about cats and poetry? Poets gaze out rain-streaked windows, write with fountain pens, drink tea, have cats: So goes the stereotype. Is it true? As far as I know, no one has conducted a strictly scientific study of whether poets are more covered in cat hair than the rest of the population. But statistically significant or not, cats and poets certainly have a long history. 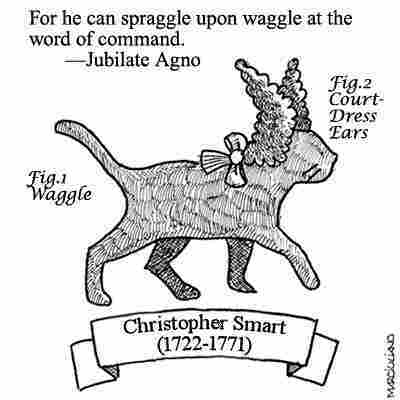 NPR books asked Francesco Marciuliano, the author of I Could Pee On This as well as a comic strip writer and a cartoonist, to help walk us through some notable cat-poet duos ... starting with Christopher Smart and his cat, Jeoffry. Smart was a devoutly religious poet in 18th century England, who had the misfortune of being thrown into an insane asylum by his father-in-law. During his confinement, he was alone in the world — except for his beloved cat, Jeoffry, who appeared in a starring role in Jubilate Agno, a long religious poem. All cats seem to believe they are incarnations of the divine, but Smart may have been the first cat owner to see toying with a mouse as proof positive of sacredness. 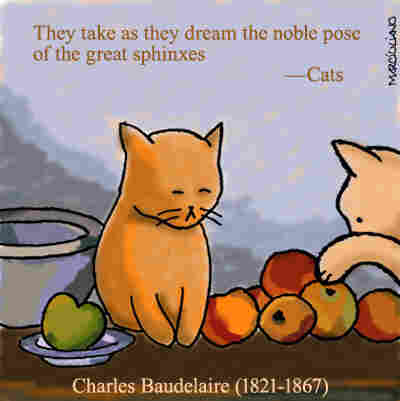 In the next century, in France, cats found another great poet to write down their praises: Charles Baudelaire, who sparked scandal with his "unwholesome" works and had an enormous influence on later French literature. Baudelaire wrote that cats were "seraphic," as subtle and harmonious as angels, which means his cats must have been much more even-tempered than mine. He also once complained in a letter that it was impossible to live with his mistress, Jeanne, who drove away his cat and brought in dogs. Quelle horreur! 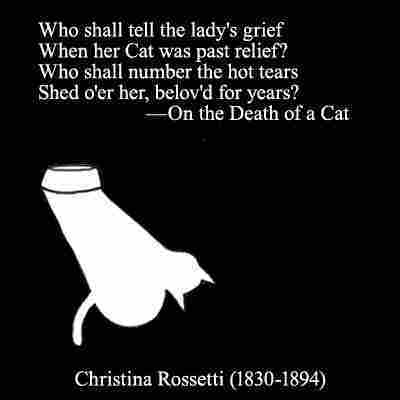 In Victorian England, the gifted poet Christina Rossetti had a weakness for longhaired cats. According to a biographer, her family visited France, and Rossetti's favorite part of the vacation was not Notre Dame, not the Seine — but the Persian cat in a hotel in Normandy. Her own semi-Persian was named Muff, and it might be Muff, under the more poetic pseudonym "Grimalkin," who inspired the feline elegy quoted here. 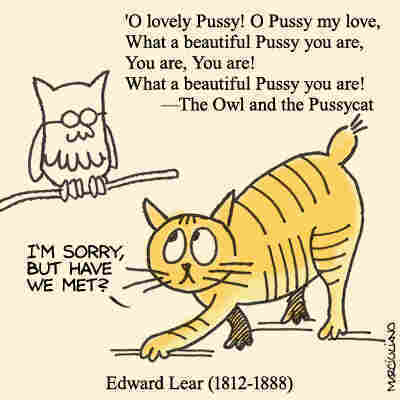 Edward Lear, nonsense poet, illustrator and prose writer, immortalized his cat, Foss, in verse and in sketches. Foss shows up in Lear's biographies where you might expect a family to appear: Legend has it that Lear had a new house built on exactly the same layout as his old house, so as not to confuse the cat. Foss wasn't a beautiful cat, with just a stub of a tail and some crazy-looking eyes — at least, so he looks in Lear's many sketches. But the nonsensist adored him. Foss died at the age of 17 and received a funeral; two months later, Lear died as well. T.S. 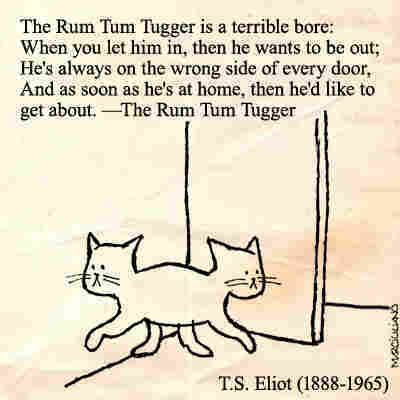 Eliot wrote the book on cat poetry, as it were. Sure, he did a few other things too — there's that one called "The Waste Land," and some guy's love song, and all that father-of-Modernism stuff. But more people around the world, by far, know him through Old Possum's Book of Practical Cats, his collection of cat poems. You might know it better in its adapted form... CATS, the musical. According to biographers, the absurd names in Practical Cats — like Rum Tum Tugger -- are not much zanier than the names Eliot gave his real-life cats, including Pettipaws, George Pushdragon, Noilly Prat and Wiscus. In one of Elizabeth Bishop's best-known poems, "One Art," she writes that "the art of losing isn't hard to master." She could have followed that up with "the art of calming down an anxious cat, on the other hand, is very hard to master" — but I guess that doesn't scan as well. Still, she did seem to spend a fair amount of time soothing nervous kittens. She wrote a lullaby for her American cat, Minnow, and wrote another poem about her Brazilian cat, Tobias, panicking during lightning storms. Stevie Smith, English poet, novelist and eccentric, wrote poetry that is nearly impossible to classify: playful but dark, unironic but not quite serious. A startling number of her works are feline in nature. 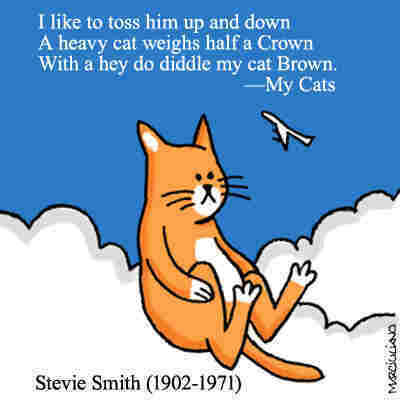 "I have written many poems about cats," Smith wrote. "I like cats, I like the look of them, I like the feel of a soft fat kitchen cat that folds boneless in one's arms. I could crush a fine cat." (Don't panic: Smith later clarifies that she never actually crushed a cat.) Smith also wrote the mind-bogglingly bizarre text for a book of glamour-shot portraits of cats. And finally, bringing our survey of cat-loving poets into the contemporary era, the Canadian poet and novelist Margaret Atwood is a confirmed cat lover. In 1977, she drew a cartoon of herself covered in cats, writing, "I have a lot of cats. What else can you do with a B.A. these days?" An unofficial survey reports that the sentiment rings true for many English majors today. 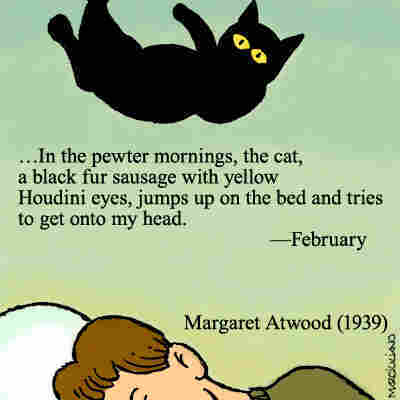 Atwood's cat poems include moving elegies and playful depictions of everyday life, and some poems that are both: "Oh pillow hog, / with your breath of raw liver, / where are you now?" Are you convinced that cats and poets are linked by more than popular stereotype? Or are you on the side of Emily Dickinson, who definitely did not take a cat with her to visit the sea? Share your favorite cat-enthusiast, dog-loving, or other-pet-crazy poet in the comments. Francesco Marciuliano, who did the illustrations for this piece, writes the syndicated comic strip Sally Forth, writes and draws the Web comic Medium Large and is the author of I Could Pee On This. His next book, I Could Chew on This and Other Poems by Dogs, will be published in July 2013. Camila Domonoske, who wrote the text, is an editorial assistant at NPR Digital Arts.